Last night we stayed at the Webb Mountain Lookout near Eureka, Montana. 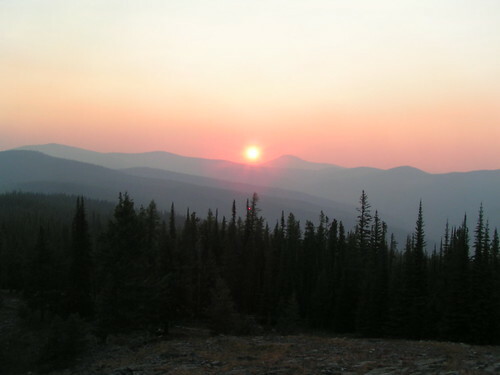 We reserved it from the Eureka ranger station, which controlled the near areas of the Kootenai National Forest. We had to drive 30 miles to get to the lookout (which was one of the only lookouts you could actually drive to! ), up a winding mountain road. The last 1/4 miles was really rough and washed out, but the poor VW made it! We had high enough clearance, although we got it up on 3 wheels, and the front end up!! Well, we made it and were rewarded with the view of sunset (above picture). This is a pic of the VW and the tower above. 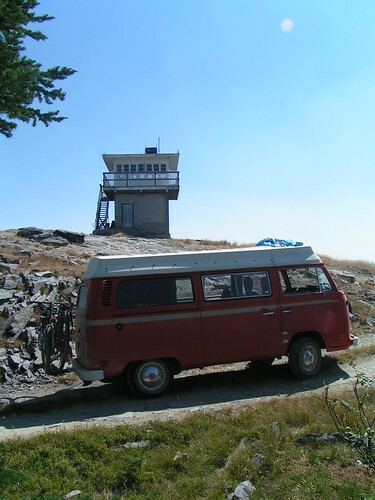 The towers were used every summer for fire lookouts. Now they are not used, because they use airplanes to watch for fires, so they can be rented out. It was really cool to stay up there. We had nice views, but it was progressivly getting smoky out because a fire just started in Glacier NP (which we didn't know at the time). The deer came at sunset and made so much noise all night! Well, the next morning, we went to visit Donna and Jeff, the people we bought the VW from last August, and we went bow shooting through a target course they made through their woods (they have 20 acres of land on the mountainside). It was fun! We only hit the target about half the time, but it was still so much fun.